Our native stingless bees have just arrived! Very exciting! 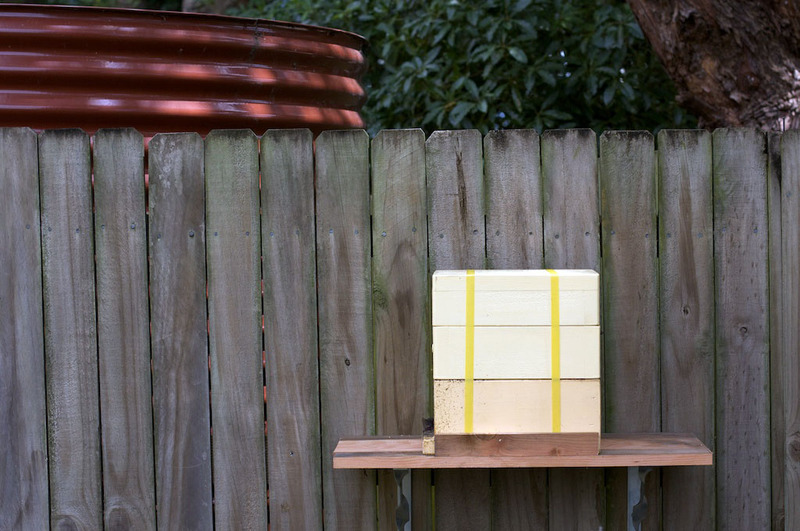 Our native stingless bees arrived today via courier. I ordered them from Tim Heard of Sugarbag in Queensland. I thought I would have to wait several months, but it was only a few weeks before they arrived via courier. I’d already picked out a place for them, on the side fence beside the house. 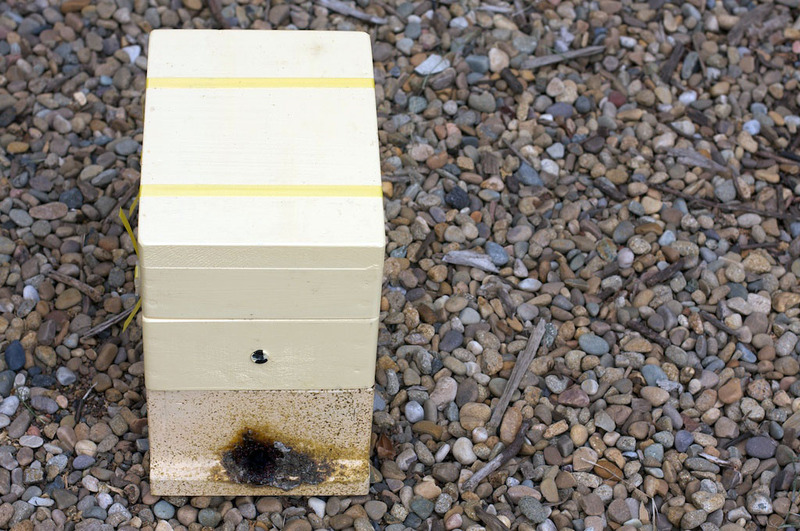 This gives the hive morning sun (useful in winter), and keeps it out of the strong afternoon sun (vital in summer). Over the weekend, I constructed a small platform for the hive to sit on (with some help). Then it was just a mater of putting up the hive, and removing the plug from the front entrance, and the one from the ventilation hole at the back. Immediately they fly out to scope out the neighbourhood, and to find their bearings. So why bees? The native stingless bees are much smaller than European bees, and as the name suggests, don’t sting. This is a good thing. The main reason for having them is to improve pollination rates for my vege patch, and for the fruit trees planned for later. This entry was posted in Growing our own food and tagged bees, native stingless bees, pollination. Just stumbled on your site James – it’s fabulous! You’ve motivated me to produce a similar blog for our pad here in Brisbane. Love the guerilla gardening stuff! and will definitely be ordering some bees too – still feel uncomfortable self pollinating our pumpkins!! I have some native stingless bees at my place in Petersham (Trigona carbonaria) so it is great to see they are starting to colonise the inner-west. I have found http://www.aussiebee.com.au/ to be an excellent source of information. 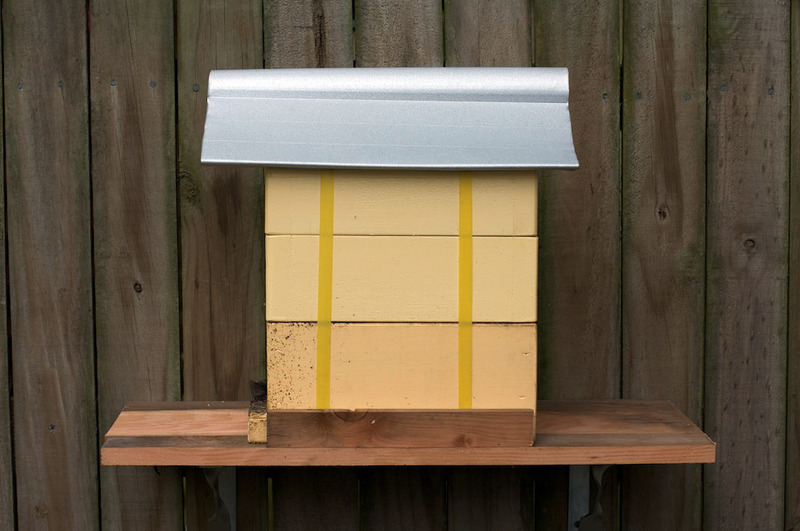 I have an “insulation” cover (painted green styrofoam box) on my hive to help protect them from the elements – this covers the whole hive. I acquired mine through the Bushcare Coordinator at Ku-ring-gai Council. James, just wondering if these bees are predators for garden pests, such as aphids and the like? I know some wasps are so thought it might be a possibility.